A young woman looks to the stars one night and finds herself imbued with their celestial power – so much so, in fact, that she accidentally burns her house down and must flee town as an outcast. 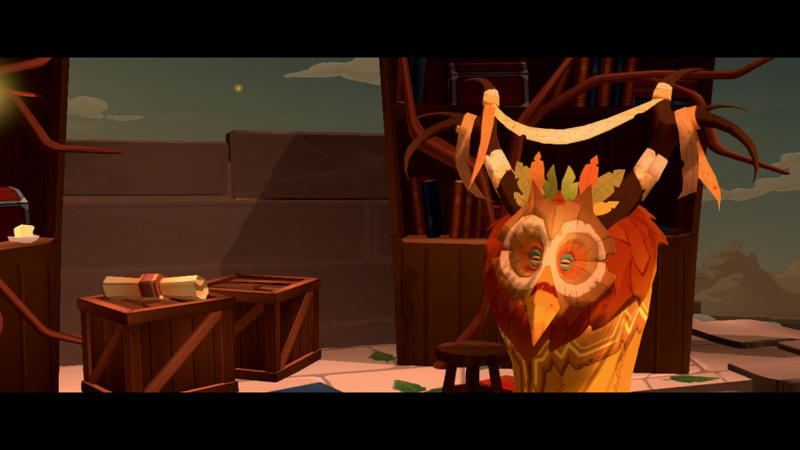 The use of magic is banned in the land of Mystralia, after all, leaving our hero Zia to seek her fate by herself. Once she encounters other exiled mages, however, she discovers her destiny may be bigger than she ever imagined. 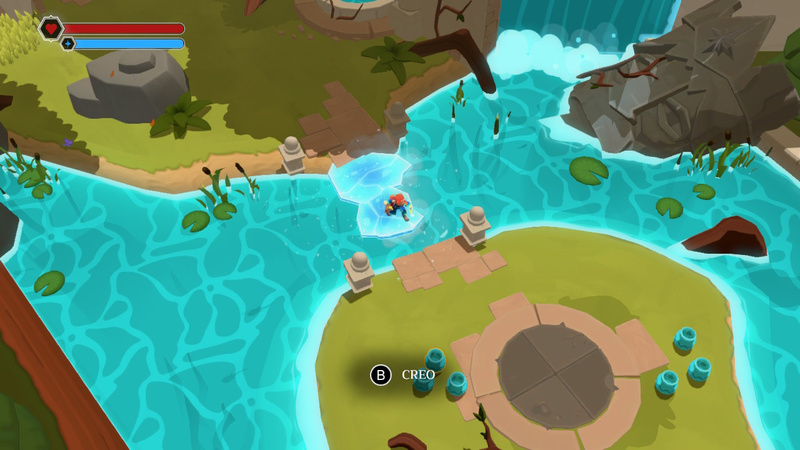 That’s where the story begins in Mages of Mystralia, a single-player isometric action-adventure game. Protagonist Zia is a spell-slinging mage through and through, a specialization that shines in every minute of gameplay. This is an experience that lives and dies on its spell-casting core. From the tutorial section onward, the player has access to four types of spells: “Immedi” with the Y button, that function as melee-like strikes; “Actus” with the X button, which are projectiles; “Creo” with the B button, which perform environmental effects; and “Ego” with ZR, which will affect Zia herself, like using a shield or performing a dash movement. That is the basis of Zia’s moveset altogether. There is no basic melee strike that is not a spell, so anything Zia does to inflict damage, navigate the world besides basic walking movement, or even solve puzzles will require mana depletion. In exchange for total reliance, the spells add a layer of complexity with elemental states as well. For example, your basic Immedi attack begins as an electrical strike, but later might be icy instead. Early in the game you can throw fireball, but eventually, this can be ball lightning instead, if you’d prefer. However, Mages of Mystralia goes one step further in its spellcrafting complexity through the use of Runes. You can map runes per each spell type in order to add effects to the spell. 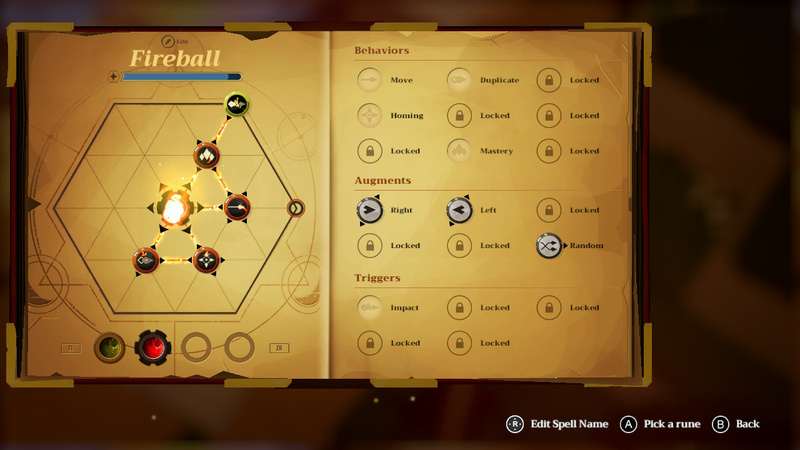 For example, if you have a fireball (adding a Move rune to your fire-type Actus spell), you can add the Homing and Duplicate runes to make it a triple fireball that automatically rights its path toward enemies. 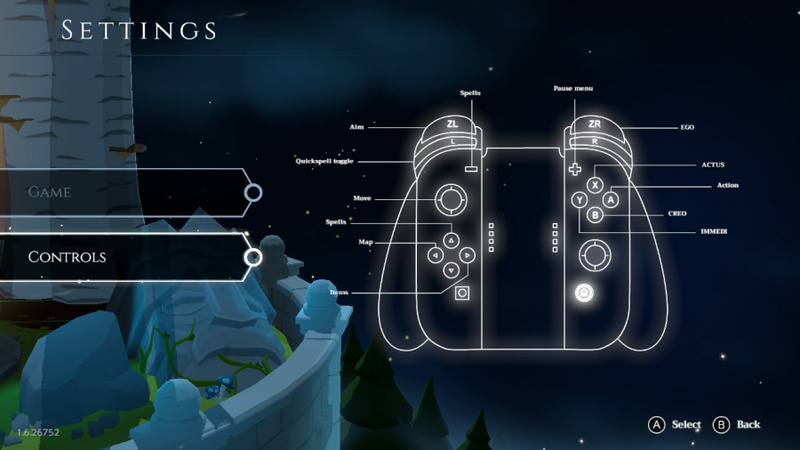 This arsenal of spells that gradually increases in complexity (you can name them, and file multiple spells per button-type) is the primary draw for Mages of Mystralia. Considering you can add the Impact rune to spells in order to cast another additional spell on the first one’s impact (which could itself potentially trigger another, and then another, and so on), there is plenty of depth of customization to be found. If you want to launch a triple fireball that explodes on impact into an area-of-effect electrical storm that bursts into ice blocks that freeze enemies and then pushes them away from you – hey, you can do that. But to what end? If the gameplay hook is “you can customize your spells a lot,” what does this hook support? It turns out that when you focus on the spellcrafting, it shows in deficiencies elsewhere. The game’s official marketing touts a story written by Ed Greenwood, who has written for properties like Dungeons & Dragons, Baldur’s Gate, and Neverwinter Nights. 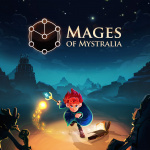 But if he wrote an epic tale for Mages of Mystralia, it is lost in some clumsy handling. Extensive dialogue can potentially be a drag in games, but here instead plot is handled in rapid exchanges and brief cutscenes that lend little gravity to events. Secondary characters are introduced, only to never be expanded upon besides their pivotal moment. The NPCs are never really memorable, beyond perhaps a single sidequest and a few lines of text to deliver. The story itself isn’t terrible necessarily, with some fantastical worldbuilding intrigue (spells fueled by the stars above! A power-hungry figure fomenting anti-mage public sentiment through despicable means!) and an emotive twist near the endgame. Mystralia has an odd pacing, though, which waters down the dramatic impact. The first couple of dungeons feel more difficult than the last couple, trending toward a final showdown that feels a bit anticlimactic. It doesn’t help that Zia will spend a lot of her time just walking around the world between objectives. There are fast-travel options, but they are tied to teleportation points on the map, just one per area. Also, although the game does not require a ton of backtracking in order to complete it, you will need to retread the landscape repeatedly if you want to find all the runes. Once you’re able to hit certain wind-activated switches or detonate specific barriers, you can unlock new paths in old environments. As hinted earlier, there are sidequests to come back to as well, even if the game unfortunately lacks a way to track them. At least Zia’s journey is not a complete chore, thanks to the pretty setting she inhabits. Mages of Mystralia is not afraid to use vibrant colours and a full palette. The ice realm is imbued with a range of blues and violet hues that make it seem less stark and sterile than other games’ 'Ice-World' locales. The lava land may feel cliché, but there are other spots like the Tomb of the Mage-Kings and a strangely dizzying Sunken Quarry that pose more originality. Yet, fans of cityscapes and townspeople may be disappointed here. 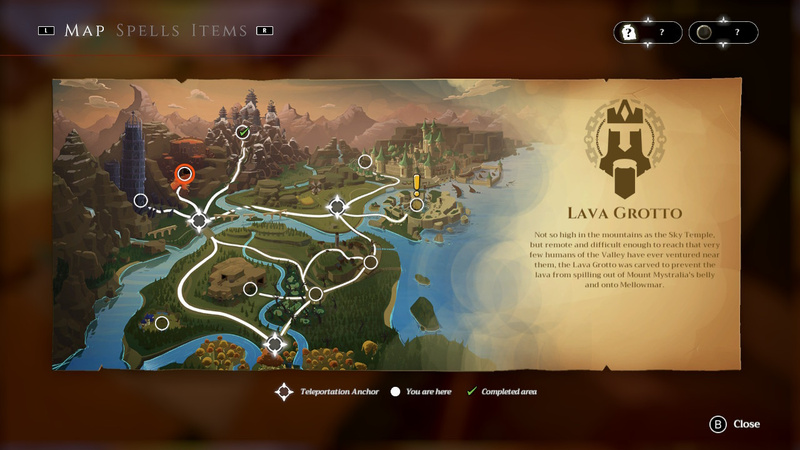 Rather than introduce new towns one after another, Mystralia relies on repeat visits to Haven, the secret gathering place of the exiled mages; and Greyleaf, the only real town to speak of (besides a few pockets here and there). In fact, the enemy variety does not bode well under close examination, either. There are a few basic units, and they are represented across different elemental varieties. Then the dungeons may each have a couple new twists on the formula, but the main highlights are the boss battles. Big, colourful and challenging, these bouts can’t be won by mindless button-mashing. The combat could have used some tightening as well. There is not much feedback on collisions, and the game seems entirely allergic to numeric indicators: You will never have a mathematical representation of enemy health, nor your spell damage, only trial-and-error experience. The A.I. is never very complex, and since you have access to long-range strikes right away, encounter difficulty is handled by turning some enemy types into bullet sponges (well, fireball sponges) and using frustrating effects like freezing you for a couple of seconds, or just summoning a few new sponges for you to deal with. If you really want to nitpick, you could write a whole separate article on how the spellcrafting, while varied and full of possibilities, is not as deep as it may seem. The runes must be placed as “nodes” which appear to have to face certain directions, but is there any discernible difference in the effect of a Mastery rune connected to a Duplicate rune, as opposed to successfully placing a Mastery rune with both a Duplicate and Homing rune? If there is not, why make the player have to place the runes in such exacting fashion like a jigsaw puzzle? And if there is, why not offer the player some kind of statistical readout or other quantifiable verification? Still, in the end, Mystralia is original enough to get pretty far on its heartfelt charm. Although some of its aspects are not up to the highest calibre, it shines in enough smaller areas (lush loading-screen art, inventive puzzling) and never truly fails in any other that it will likely be an enjoyable, if not perfect, playthrough for those who enjoy spell-slinging action titles. Shame, I was really looking forward to mixing up some unique spells. Will wait for a sale to pick it up then. Too bad, I thought this looked pretty good. Where is the Physical version. It's a shame to hear about the shortcomings here... I was planning on buying this next week but will pass for now. I certainly like the idea of an adventure game playing as a mage, usually magic is a secondary skill or ability or something used by supporting characters. So it is a bit of a shame to hear a game that focuses on it is fairly weak. It isn't nearly as rough as the review explains. I have it on Steam and I got it again on the Switch. The game is lovely. Side quests are fun distraction that don't pull you away from the main story so much as it makes you more aware of your surroundings to pick up items or do certain tasks to help an NPC out. The gameplay I feel is rushed, you don't really earn your magic abilities.. they're given as you walk through the opening credits, but you do have some RPG elements and modify them, also make up to 3 modified versions of each magic ability for the moments when you need to curve (turn) your fire projectile, than switch back to just straight fire projectile. The game was and is beautiful. Problem solving in their puzzles are clever and fun. 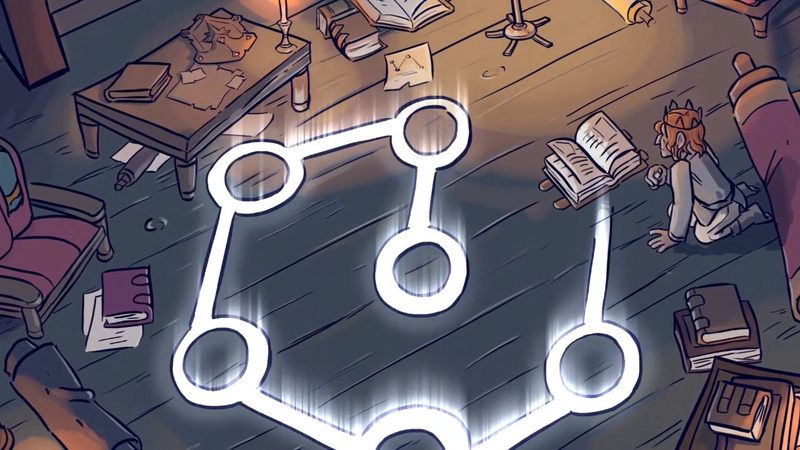 They have multiple styles from using magic to solve puzzles or moving pieces around to connect lines in a mage puzzle. 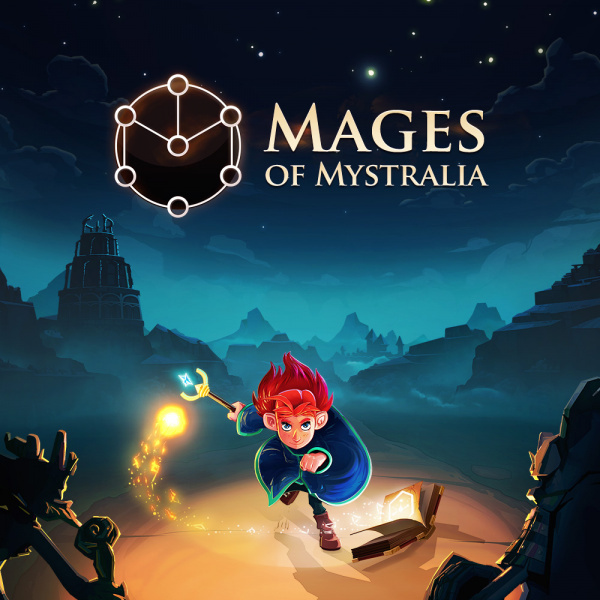 Like Stardew Valley, RiME, or Yonder, Mages of Mystralia is a chill game. It has a cute lore to it and you can get lost in running around breaking barrels or finding things for NPCs. The game has you back track a lot in some areas, whether the path is blocked, helping an NPC or going back to a puzzle that you just gained a magic ability to help solve. If you like a simpler Zelda type game that mixes isometric camera angles, puzzles, magic and action adventure RPG games, you'll enjoy this. I'm a fan of the X-Men Legends/Marvel Ultimate Alliance franchises, Nine Parchments, Travis Strikes Again (it's growing on me) and Diablo III, you'll enjoy this. I've been enjoying isometric games a lot lately and playing them on the Switch is a Godsend. My only gripes is I feel like the audio is very low for the Switch. Could have been fun couch co-op. Maybe they add it for replayability, but having to kill baddies every time you re-enter a load area is annoying. Outside of those, being able to play this on my Switch over my PC or Steam Link to my Android TV is beyond amazing. The price isn't bad for what you get either. I have been looking forward to this game since it was announced and it did not disappoint, even remotely. Next month, keep an eye on RemiLore. If you like these type games, keep an eye out on RemiLore as well. It comes on Switch late next month, I think the 26th? Also, I cannot wait for Marvel Ultimate Alliance 3! 2 of my favorite franchies wil be on Switch soon. First being Diablo and second being Marvel Ultimate Alliance. Not sure if Kingdom Hearts will ever make an appearance.. and Microsoft has Fable locked down unfortunately. 1. There is no confirmation before leaving one area to enter another; you just walk past a certain point and then you're in the loading screen. This is annoying if you didn't mean to go to the next area, because the load times are somewhat long, plus when you go back to the previous area any enemies you killed probably re-spawned. 2. No list of uncompleted side quests. 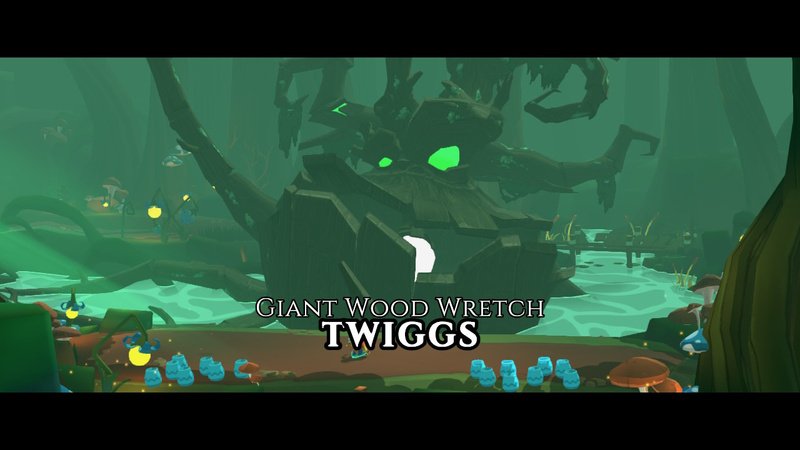 Otherwise it's a delightful and polished game. I'd definitely recommend not ruling the game out just on the basis of this review. If you were looking forward to it, read some other reviews or watch some gameplay on youtube before deciding.